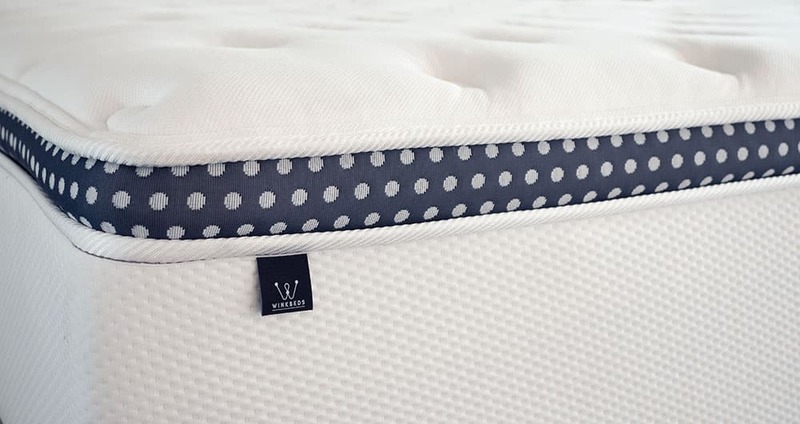 WinkBeds Plus Mattress Review - Made For Heavier People? 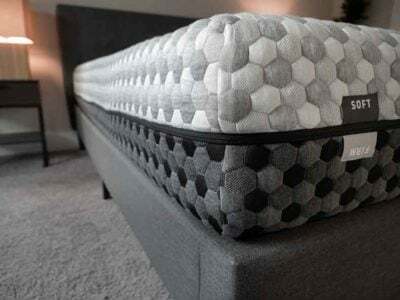 Home » WinkBeds Plus Mattress Review – Made For Heavier People? 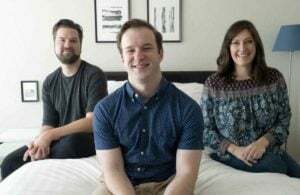 WinkBeds Plus Mattress Review – Made For Heavier People? WinkBeds is a bed-in-a-box company that offers four hybrid models fit for different types of sleepers. 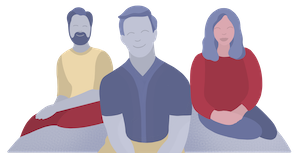 Their line includes the Soft, Luxury Firm, Firm, and the Plus, their firmest mattress. The WinkBeds Plus is designed specifically for larger people. Its durable construction is meant to combat many of the issues that heavier people deal with when it comes to their mattresses. It incorporates an anti-sagging foam and a very supportive individually wrapped coil system. As a heavier person, did the WinkBeds meet my needs? Read on for my full review. You are a heavier-weight back or stomach sleeper. 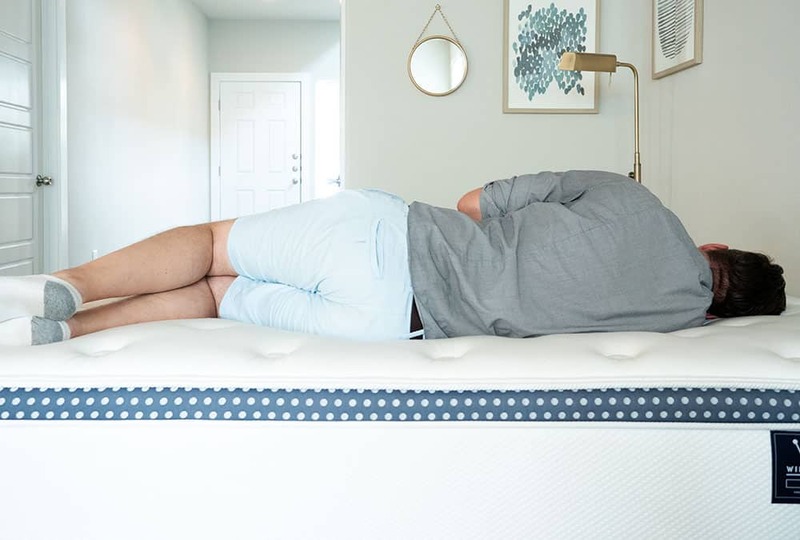 This mattress is quite firm and is made to be supportive for heavier people. On your back and stomach, you shouldn’t have the issue of your hips sinking in too far and taking your spine out of alignment. You sleep hot. 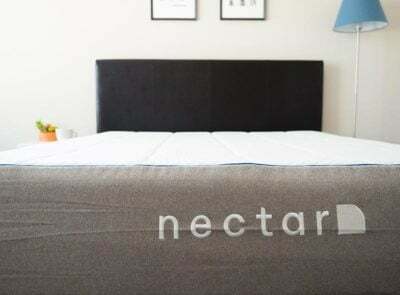 The Tencel fabric in the cover, the open-celled latex, and the individually wrapped coils all promote cooling in this mattress. You shouldn’t have to worry about sleeping hot on this mattress. You are looking for a long-term investment. The polyfoam layers in this mattress are very high-density. In addition, the individually wrapped coils add another level of durability. All of this means this mattress should last for quite a while. If you are looking for a long-term investment, this could be a good choice for you. You are a side sleeper. If you sleep primarily on your side, this mattress may be a bit too firm for you. Especially if you are a lighter person, you may not get the proper pressure relief. If this is the case, I would look at one of WinkBeds’ softer options. You prefer a softer mattress. Even if you are a heavier person, it is worth noting that this is a firmer mattress. If you prefer a softer mattress, this may not meet your needs. You prefer a memory foam feel. If you like your mattress to slowly compress, allowing you to sleep “in” your mattress, the WinkBeds plus may not be the best choice. It has more of an innerspring feel with some bounce to it. The mattress is 15″ tall. The cover is soft, tufted, and quilted with 2″ of a high-density Body Impression Proof Foam. It is also woven together with Tencel fabric. 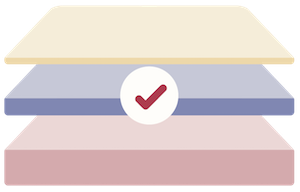 Next, there is 2.5″ of an open-celled, seven-zoned latex support layer. After this is 7.5″ of a three-zone, TexasQUAD individually wrapped support coil system. Finally, there is about 3″ of a high-density polyfoam layer. The mattress is surrounded by an extraEDGE Support System. This adds more surface area to the mattress and helps with edge support. 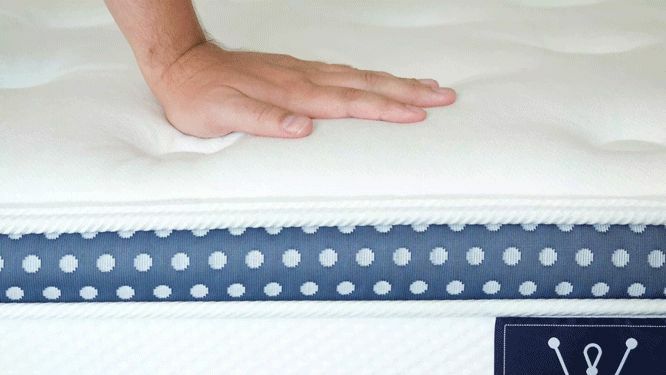 The foams in the mattress are Certi-PUR certified, and the cover is OEKO-TEX® Standard 100, Class 1 certified. This means the mattress is more eco-friendly overall. The Winkbeds Plus is made in the USA. The mattress is available in Twin, Twin XL, Full, Queen, King, California King. The cover, breathable latex layer, and airflow-promoting, individually wrapped coils combine to ensure you don’t sleep hot on this mattress. The foams are high-density, and the coils also add another layer of durability. 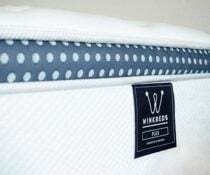 Together, this means the WinkBeds should be a durable mattress overall and should be long-lasting. The latex layer has seven distinct support zones that add extra support under key areas. This is especially helpful for supporting heavier people. The individually wrapped coils are made to be durable and extra-supportive for heavier people. The top layer is foam and is designed to be sag-proof. Sagging and indentation are often an issue with heavier people on foam mattresses. For me, the mattress felt like a 7.5 out of 10, or a bit firmer than average. The top layer is quite soft, but the layers get firm right beneath that. The latex layer gives me great support when I am on my back and stomach. As a larger person, it is sometimes difficult for me to find mattresses that support me when I am on my stomach. That is not an issue here. However, I am a side sleeper, and I did feel some firmness on my shoulders and hips when I tried the mattress on my side. Again, this is a firmer-than-average mattress, so I think it is a bit too firm for me on my side. The Winkbeds plus contains what the company calls SLEEPCALM™ Motion Isolation Technology. The gel layer and coil system are specifically designed to cut down on motion transfer. How well does it work? I tested the motion isolation with a water glass. When I pressed down in the mattress, the glass was disturbed somewhat. I also rolled around on the other side of the mattress, and the glass did move. 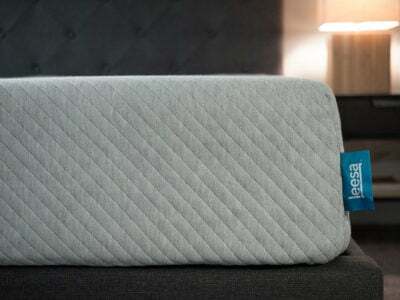 For a pillow-top, hybrid mattress, the motion isolation is not bad on the WinkBeds Plus. However, if you barely want to feel your partner move at night, I would look at an all-foam mattress. This mattress has a foam encasement that is made to give extra surface area to the mattress and also help with edge support. The WinkBeds Plus also has individually wrapped coils that usually help with edge support. Because of these features, I was not surprised by the good edge support on this mattress. Sitting near the edge, the mattress barely compressed. Also, lying down, I felt secure all the way to the edge. In neither position did I feel like I was going to fall or roll off the mattress. You can see the good edge support on the Winkbeds Plus in the photo below. It is a great option for heavier back and stomach sleepers. This mattress is designed for heavier people and gives extra support in both these positions. It even has zoned support so it is firmer under heavier areas of the body. The mattress should do a great job of staying cool. The gel layer and cover are designed to dissipate heat, and the individually wrapped coils promote airflow as well. This should be a long-lasting mattress. The sag-proof foam and base layer are both very high-density. Also, the coil system adds even more durability. These factors together mean this mattress should last for quite some time. I would say the WinkBeds Plus does what it was designed to do. 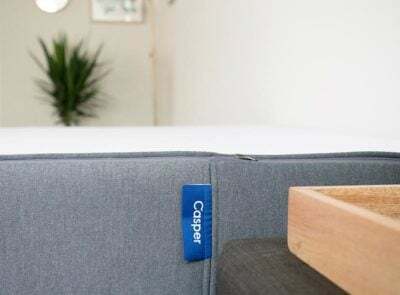 It supports a heavier person like me and is made to fight sagging and other mattress issues associated with heavier sleepers. In addition, it should sleep cool and be long-lasting. However, if you are a lighter person or a side sleeper, this mattress might be too firm for you. The WinkBeds Plus comes with a 120-night trial, a Lifetime Limited Warranty, and free shipping. Financing is also available.